As a university student, moving in and out of accommodation will be something that you will become somewhat familiar with. As someone who has once lived in halls, and now as a second year I live in a student house, I know just what it’s like, and those daunting white walls and dodgy radiators can seem a little cold and make you feel just a bit homesick. Well, as someone who very much needs her home comforts, I have made a little list of cheap but wonderfully aesthetic ways of sprucing your new place up without breaking the bank! You may not be able to paint the walls and paste that feature wallpaper in your rented room, but that doesn’t stop you from getting a bit of blu tack and getting creative. 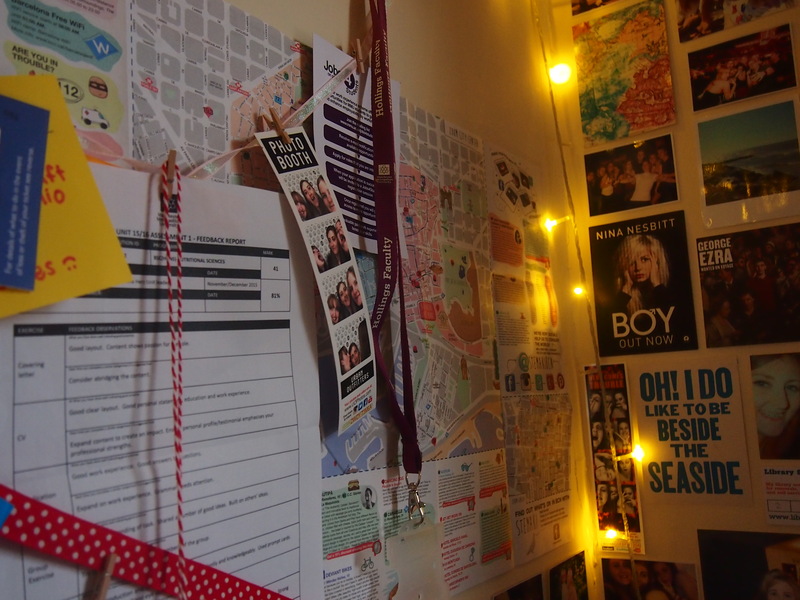 As well as my photo wall (always a must in a room), I have little bits and bobs I’ve collected over the years hung around to fill up all the blank space. Things such as maps, mini chalkboards and postcards are cheap (often free!) little things to stick to the walls. Or, why not create you own notice board? I simply have taken a pretty piece of ribbon, and attached pegs and important little notes from it, which not only gives a cute, quirky feel, but keeps you super organised too! My mini chalkboard cost around £2 from a local craft shop, my ribbon cost around £1 a roll from Wilkinsons and I purchased the pegs for less than a pound from various sellers on eBay. Oh, and my map is a super funky tourist guide of Barcelona (which was free!!). 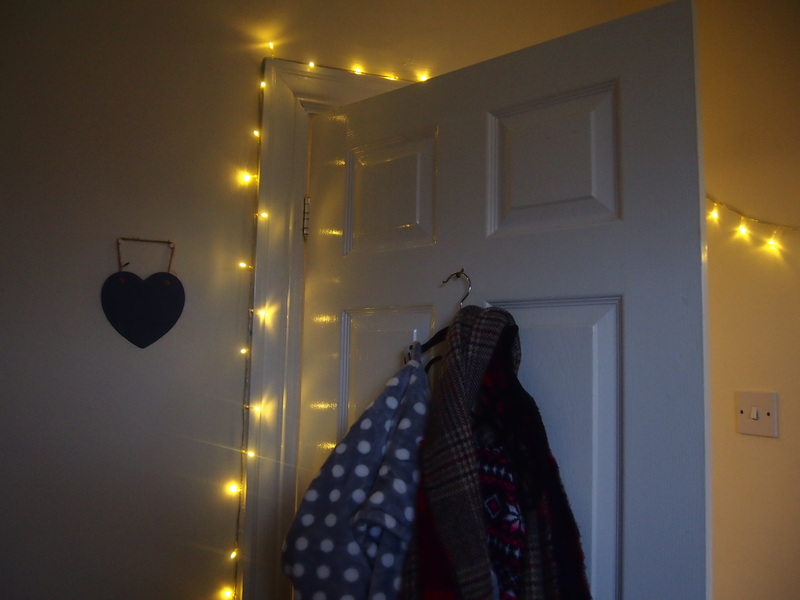 One of my FAVOURITE things to decorate any room is fairy lights. They make any environment look x100 better, adding atmosphere and warmth to even the dingiest of digs! Mine are drapped across my door, wall and desk and were purchased from eBay for around £6 for 10m (look carefully, you can find bargains!). My living room also has the same string of lights in pink. Candles are the perfect option for a cosy, delightful scented treat in any room. Primark is your absolute saviour when it comes to getting these little extras for your room. 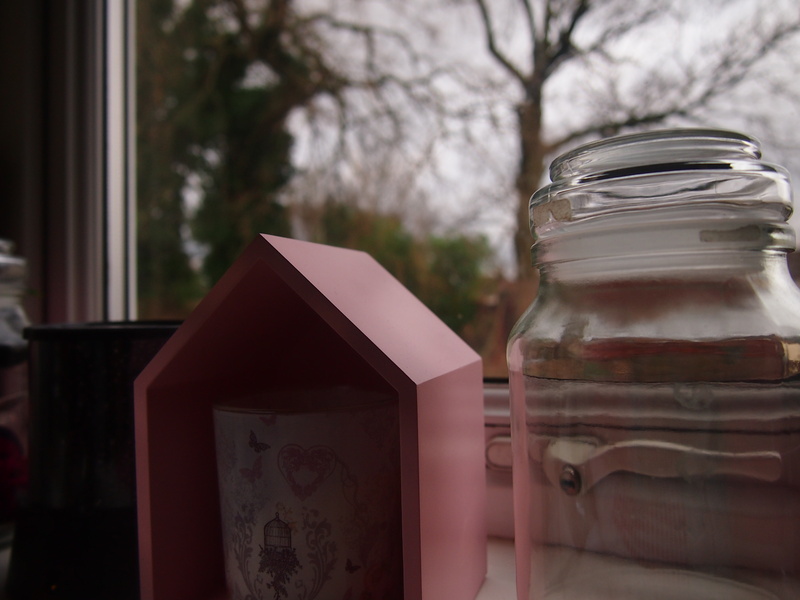 Most jar candles are around £2 and smell incredible, as well as burning for hours on end. Try getting different colours and fragrances to mix things up a little. Jars are also perfect. They’re great for keeping little bits, jewellery and make up and are extremely cheap. Charity shops and wholesale are cheap places for these, or like me, why not just wash out your empty coffee jars for free? My little house shaped accessories are from New Look, which I purchased for just £2 for two in the sale!! (New Look is a great place to grab a few homeware bargains). Come on now, everyone needs a cuddle every now and again, especially when you’re at uni. Pretty printed duvets, blankets, pillows and even a cuddly toy will make your uni room feel so much more like home. And lets admit it, a pretty bedsheet makes sleeping in after a night out just a little bit better..
My puppy (Dylan!) 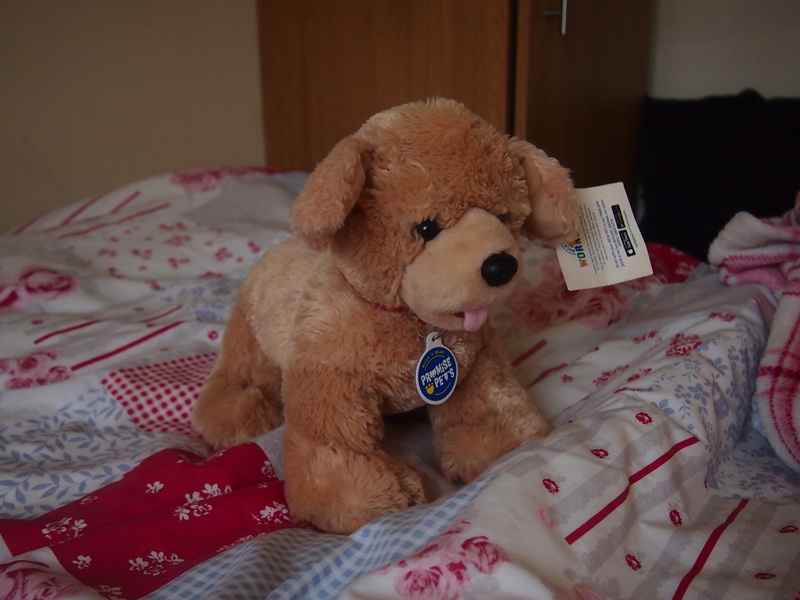 was a gift from Build-A-Bear Workshop, my double duvet set and blanket were from Matalan and my pillows (not pictured) are from Ikea. Uni rooms are often small with small windows and restricted space. To add more light (and make my room look magical), I have made hanging mirror lights. 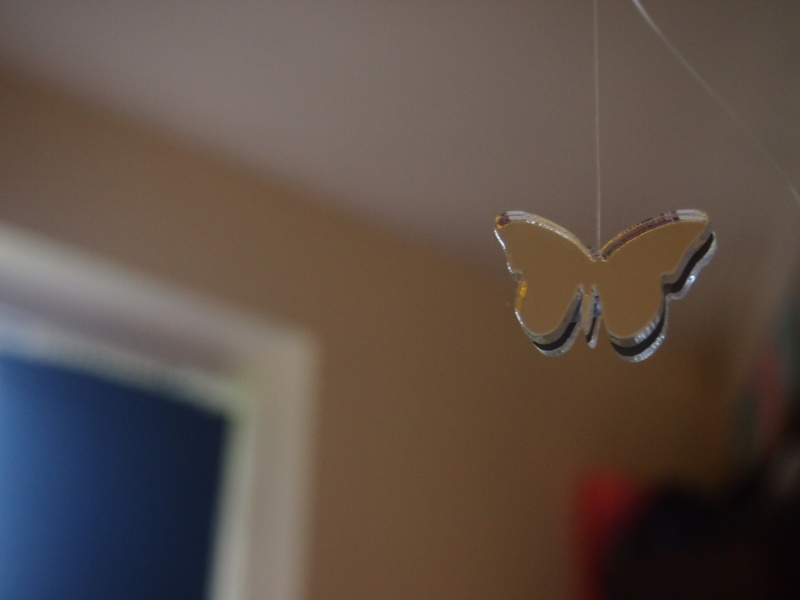 The mini shaped (butterfly in my case) mirrors were purchased for about £7 for a sheet of 20 on eBay, and I brought clear string to hang them from the window, cupboards and even my mirror. I stuck each one back to back so they reflect light from all directions. So girls, from experience and every single girl I know, mirrors at uni can often be small, scratched and in the most awkward places. In my first year, mine was above my sink and I was too short to see into it properly… oops. 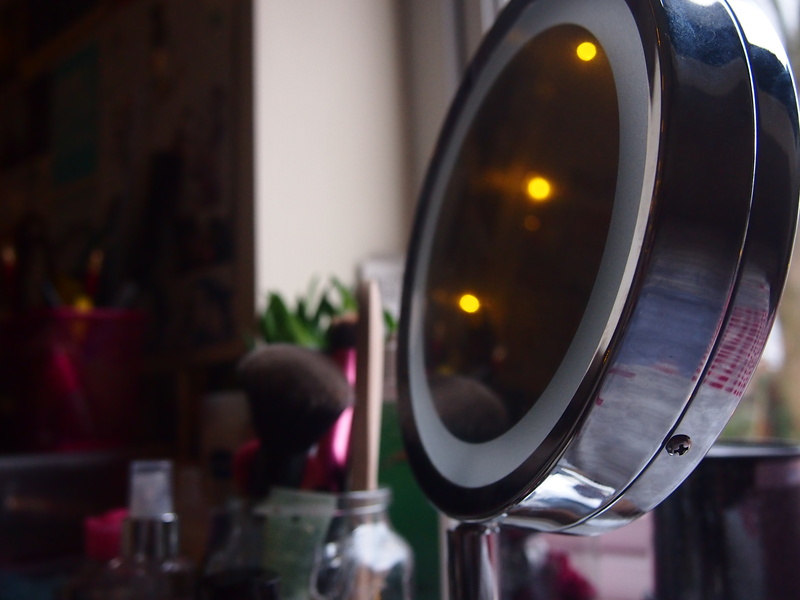 Make up mirrors are saviours!! And it will make you feel so much better to sit down and relax to do your make up, whether it be for a special event or even a night out. Mine was from No7 at Boots for around £50 full price, but they often go on special discounts and half price sales several times a year!